A car-park in Dubai after rainfall ... Deckshield protection. Special attention should be given to the selection of car-park deck coatings to ensure that they can withstand both the scorching sunlight as well as flash floods that the region is subjected to, says Vik Vithlani*. Creating a high-quality car-park floor requires a careful assessment of the many types of challenges that the surface will inevitably face. Alongside potentially deteriorating factors such as constant traffic, corrosive automotive oils and heavy vehicles turning in tight circles, exposure to the elements is a key issue that needs to be addressed to ensure an effective and long-lasting car-park traffic coating. Getting the finish right is critical, as it protects the reinforced concrete against water ingress, petrol spillages and other pollutants, which can affect the integrity of the building’s underlying structure. Failing to properly shield the substrate from these issues could lead to long-term maintenance programmes, increased operations costs and potential deck failure. The pooling of water within a car-park can also have serious repercussions on both the integrity of the floor as well as the safety of the site for pedestrians. In order to prevent this, adequate provisions must be made for rainwater collection, drainage and removal. Falls and specialist drainage systems must be incorporated into both internal and external deck floor details in order to reliably deal with high volumes of water. The importance of choosing waterproof materials with effective drainage was exemplified recently during the flooding that the UAE experienced in March, as substantial damage was caused due to many buildings’ lack of adequate drainage or having been constructed using non-waterproof materials. Despite the rain only lasting for a day, the overall inability of the region’s infrastructure to cope with the downpour led to a significant disruption in people’s daily lives as well as the productivity of many businesses. 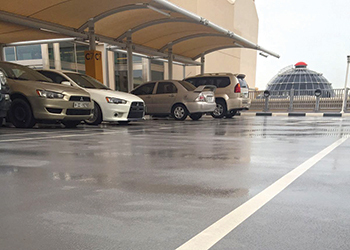 Deckshield ED from Flowcrete Middle East has been designed to ensure that exposed car-park decks can withstand such conditions. The polyurethane formulation of this system ensures that it maintains a seamless and impervious finish so that any liquid on the surface quickly and easily flows towards drainage channels. In fact, polyurethane systems are becoming increasingly popular for car-park environments, as they can be installed at various thicknesses, depending on the specification, to not only protect the substrate but also to improve both the site’s aesthetics and safety. The full polyurethane formulation of Deckshield ED makes it incredibly hard-wearing in comparison to hybrid systems, which instead combine a polyurethane topcoat with an epoxy primer. The epoxy primer used in hybrid systems means that the final finish is rigid and brittle, making it more prone to failure than a polyurethane primer. This flexibility ensures that Deckshield is able to withstand the deflection within the car-park structure, caused by intense multiflow traffic. The drainage needs to be checked to ensure that it is sufficient to carry potential rainfall away into the main drainage system and to identify what will happen in the event of a deluge. If the drainage is not up to the task of avoiding water rising up to dangerous levels then it needs to be changed or additional drainage should be installed. The other natural element that car-parks in the Gulf region need to be protected against is the high level of intense ultraviolet (UV) sunlight that they will inevitably be faced with, which is particularly problematic on the top deck of any car-parking structure. In fact, UV radiation is one of the biggest causes of deterioration, discolouring and premature ageing of protective car-park coating materials. To withstand such deterioration, a heavy-duty, UV-stable and elastomeric waterproofing system is required. Typically double the thickness of most material recommended for internal decks, this heavy-weight polyurethane provides the durability and elastomeric capabilities required to take on the tough conditions at the top of the car-park. Aliphatic polyurethane products such as the Deckshield UV Topcoat are more effective at withstanding UV radiation than aromatic coatings. The types of polyols and isocyanates that make up aliphatic solutions prevent them from yellowing under direct sunlight. To create a car-park able to withstand everything that the weather and users would throw at it, Majid Al Futtaim’s Mall of the Emirates (MoE) in Dubai, UAE, recently installed 42,000 sq m of Deckshield flooring systems when it upgraded its parking facility as part of a Dh1-billion ($272 million) redevelopment of the shopping centre. Majid Al Futtaim recognised the importance that its car-parking facilities would play in delivering high-levels of customer satisfaction once the redevelopment work had been concluded. To accommodate the site’s enlarged visitor capacity, it was vital for the mall to increase the number of available car-parking spaces. To meet this need and provide an additional 1,300 spaces, the MoE added a new, exposed fourth level to its parking structure. This exposed deck needed to be able to maintain an effective, visually appealing surface despite the challenges that the site’s future use would inflict on the floor. Deckshield’s robust nature meant that the bright, eye-catching floor design desired at MoE wouldn’t fade over time. The seamless, easy-to-clean finish Deckshield creates would also help the site’s cleaning regime to avoid stains and spillages that would spoil the floor’s appearance. Specifying traffic coating materials that have been formulated to withstand exposure to the elements is vital for car-park operators in the Gulf region who are eager to ensure that the floor of their facilities retains an attractive and functional surface for an extended period of time – preventing the risk of floor failures that will not only make the car-park look unattractive, but that could also pose serious risks during severe weather events. • Vik Vithlani is Business Development Manager at the UAE-based Flowcrete Middle East.